The limitations of the fundamental understanding we possess about our own trade or profession and other trades or professions we need to interface with or are connected to or dependent upon. Professionalism is taking responsibility for your actions and omissions, and learning and growing from them. Unprofessionalism is the refusal to take responsibility of and/or learn from one’s mistakes and shortcomings. The knowledge I have to pass on to homeowners and other professionals I possess because I too have made my share of mistakes over the decades, and have learned and grown from them — by practicing professionalism. It also seems that my problem solving oriented approach to projects makes me somewhat of a magnet for more than a fair share of problems caused by others’ unprofessionalism, their refusal or inability to fix their own mistakes. The accounts of my experiences in dealing with the unprofessionalism of others I intend to share here are not intended to demean any individual or business, I write here to provide learning experiences for the reader, be they homeowners looking to contract remodeling services or other industry professionals. Though my frustrations about specific problems or their causes may be readily apparent in my writing, they are not expressed for the sake of arrogant or belittlement of a single party. My true frustration is far more general in nature, and lies with far more influential groups and associations within our society. Life has an uncanny way of connecting us to what we choose as being important to ourselves . The day that I finished my post about the Whirlpool slide-in range, I went to a trade show and at Whirlpool’s booth, I met some members of their upper-level management team and shared the thoughts in my previous post about their slide-in range. Normally those booths are only staffed with salespeople, so this was a fortunate opportunity. They seemed truly amazed that I could not find the peel and stick trim kit accessory anywhere, and promised to send me one to evaluate. They also seemed to listen intently to my concerns about the viability of a peel and stick accessory, and vowed to follow up with their design dept to see if a more permanent alternative accessory could be made. Another topic I brought up to them was the need to have more open lines of communication between professionals like myself, who specify and install their products and their upper-level design and engineering team. I suggested using some type of login verification system for pros and their website or social media sites to allow professionals to communicate product deficiencies or needs directly to their upper level decision makers. They appeared intrigued by the idea and recognized a need and benefits to them instituting such a system. The good part of this meeting was they both genuinely seemed interested and understood my concerns. Now comes the wait to see if the people above them that make the final decisions share their concern and sincerity. I will keep you posted on any updates. Please keep letting them know your thoughts. The more of us who act on this, the more likely we will see a change for the better. We can all make a difference, one person at a time! 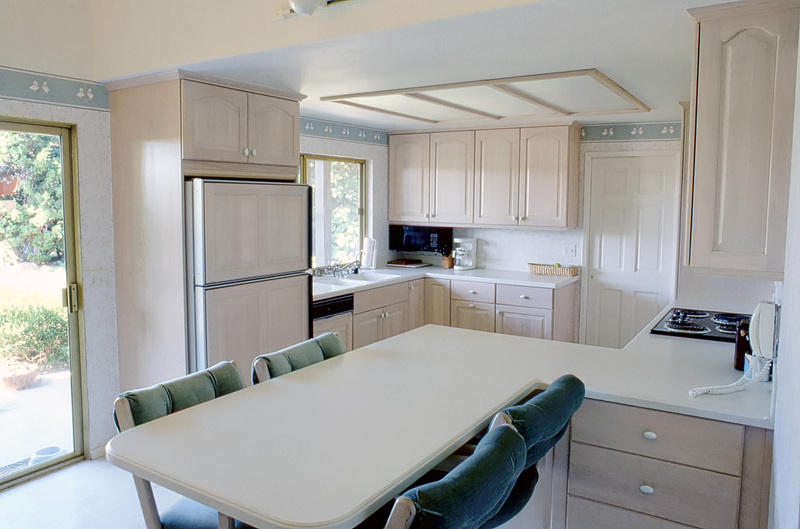 Slide-in ranges have been a staple of the kitchen industry and my remodeling projects for over 4 decades. On a very recently completed job, it came to light that the Whirlpool corporation, without notice or apparent care for long-established industry norms, is now actively advertising what are effectively freestanding ranges as slide-in ranges! They have morphed slide-in ranges and free standing ranges into one range by simply waving their hands and saying a lot of nonsense and advertising gibberish about how much more convenient and easy to install their new slide in range is. To make it a slide-in you simply apply their peal and stick slide in accessory to the countertop to make it look like a slide-in. Really? Peel and Stick? What trash. How stupid do they think the public and Kitchen Professionals are? Despite their advertising that this accessory is readily available, I challenge you to find that accessory. It is in their catalog, but good luck getting one. I tried to buy one just to see how bad it really looked and include a picture in this article, but none of my appliance suppliers said they could order it. I then went to the KitchenAid website to order this accessory direct from them. The part is there on the site, but when you click ADD to Cart, nothing happens. So you can’t even buy this part directly from the manufacture. Without this trim kit accessory, this “Slide in Range” is nothing more than a “free-standing range”, with a deceptively misleading name. This move affects the entire Whirlpool product line, KitchenAid, JennAir, and all the others. For decades, KitchenAid was my top choices for high quality good value appliances, but no more. What is a Slide-in Range? A flange (or a lip) that overlaps the countertop. The lip has a gasket under it so the gasket seals the joint between the range and the countertop. There is one other less significant factor that typifies a slide-in range. When fully installed, the front of the range only sticks out past the countertop face a few inches while many—not all—freestanding ranges protrude further. Of the above characteristics, the primary factor that distinguishes a slide-in range from a freestanding range is the flange around the sides and back of the top surface. What is the purpose of that lip or flange? A slide-in range is meant to be installed by raising the legs on the range to a height that puts the lip above the top of the countertop, sliding it all the way into place, then lowering the legs until the flange touches the countertop. This results in a firm seal between the countertop and the flange, which prevents crumbs, liquids, and other small items from run down the sides of the range and cabinets to the floor and collect in places you can’t get to or clean. Close up of Bosch Slide In shows no need for special notches. The pictures above are of a Bosch slide-in range. If you look at the close up, you can see it was designed such that no notches were needed in the countertop and this model does not need a piece of stone behind the range because it was designed to go right up against the wall. As shown in the two pictures below of an older model KitchenAid real slide-in range, note in the close up that there were no notches or special cuts needed in the countertop to install this range. The depth of this old KitchenAid did require a small piece of countertop behind the range between the range and the wall. 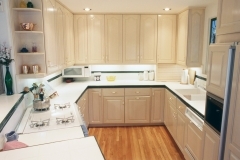 The only calculation needed was to take the depth of the countertop and subtract the depth of the range to the front counter stop, to find the size of the countertop needed behind the range, (normally 1 to 2″). If your installers can not do that simple math, do you really have the right installer for your project? On very occasions where the countertop edge was thicker than normal or a very ornate edge used, a notch could be used at the front of the counter to make the transition from the counter edge to the range look better. Determining the need or location of that notch was not rocket science, and it was not needed for the majority of applications with that model KitchenAid range. Many other manufacturers who make slide-in ranges have modified their flanges so that notching of the front edge is not necessary at all. The two pictures below are close-ups of our featured picture at the top of this article, a new range that KitchenAid calls a slide-in. These close ups show clearly this range does not have a flange that sits on the countertop as you can see me sliding a business card down the space between the range and the counter and cabinet. That is the biggest difference between a slide-in and a free standing range! How can Whirlpool (and all of its subsidiary brands) have the arrogance and disrespect of industry history and definition to claim differently? They only do it because they are so big they think they can. They use the BIG LIE concept in their advertising, distort reality stating, a lie that most people can not understand, that all old slide-in ranges were too difficult to install, then wrap it with another lie that they made this change to make this new model easier to install. This is all a big lie, because THE OLD MODEL WAS NOT DIFFICULT TO INSTALL. Ownership that actually cares about quality, customer service, and reputation is almost non-existent in the appliance industry today. All of the old companies like KitchenAid (now a Whirlpool owned brand) that once took pride in and marketed their business on the reputation and quality of their product offerings and customer service have been purchased by larger corporations that are run by what I call “Bean Counters”. These Bean Counters range from top level corporate CFO’s and CEO’s to production facility managers, who all get their bonuses by making more money for the company, by increasing profit margins wherever they can. All “Bean Counters” care about is MONEY. Their only concern is to maximize profits by cutting any possible costs while raising prices as high as they can. “Bean Counters” by nature are short-term thinkers. That statement by Whirlpool is categorically not true as evidenced by the pictures above of the old KitchenAid real slide in and the new Bosch Slide in pictures. There was no extra milling of the front edge or notching of the front, in any of those pictures, and in most installations I have done in the last 15 years, the only added item needed was a small 2″ piece of countertop behind the old KitchenAid range for the flange to rest on. Like Bosch model in the pictures above and many other manufacturers their new model does go all the way to the wall now allowing for a large oven and cooktop surface, which are good improvements. But without a viable flange to truly make this oven a Slide-In they are just removing a needed product from the market but trying to keep us buying it by deception on their part. FIT System installations make Whirlpool’s products more appealing to commercial builders whom also subscribe to the bean counter mentality of cutting all possible costs even if it sacrifices the quality or function of the final product. The FIT System also encourages the lack of knowledge of proper installation techniques. Imagine working with a remodeler who can’t install your range because it doesn’t use Whirlpool’s simplified installation system — five years down the line, this may very well become the norm. It also allows the manufacturer to sell additional accessories/installation kits to provide the functionality of the flange a proper slide-in range would have had out of the box. If you can find them. I tried and could not. At face value, Whirlpool’s FIT System reads like an innovation and a natural progression of technology. In reality, they’re changing established industry conventions in order to benefit themselves while pitching it as a benefit to builders, remodelers, and homeowners. They have in essence taken a needed product off the market. Out of stock with no expected availability. Question: Has it ever been in stock? Why should homeowners who want built-in appliances be denied those appliances because Whirlpool has unilaterally decided all installers are not smart enough to install them? There absolutely are installers who don’t have a clue about installing and planning for built-in appliances, but there also are many installers who are very capable of planning and executing for built-in customized appliance installations. That is why we need both built in appliances and free standing, so consumers and professionals have a choice. You also have a choice of who to install them. If you want built-in customized appliances make, sure you higher a smarter installer, If you want free-standing, install it yourself or hire any installer. Whirlpool needs to be held accountable for its shameful indifference for historical industry definition and deceptive advertising of this product as a slide-in. It is necessary for industry professionals and the general public to start sending the message that enough is enough! Whirlpool has crossed a line with this choice of direction in its products. Tell them you don’t like it. Tell them you will buy other brands if they don’t offer products you need and want. There are other companies to buy from. KitchenAid is no longer a go to brand for me, the value is no longer there. If you are an industry professional who cares about your profession or a consumer who wants more choices and options available, not less, I urge you to contact Whirlpool to let them know what you think. We can make a big difference one complaint at a time. Both of these perspectives are NOT TRUE — all toilets are not made the same. How they are designed and manufactured has a huge effect on how well they flush. Water prices keep going up and building codes are requiring lower and lower flush rates on toilets. Here in California, the current code for toilets is down to only 1.28 gallons per flush. Like most of the newer politically motivated building codes, this one is poorly written, confusing, and misleading to consumers. Confusing and misleading because they are not told by the code that there is a wide range of functionality available among toilets that meet the code’s standard, so they are lead to believe that all toilets that meet the code are functionally the same. However, a toilet that only uses 1.28 gallons per flush does not save any water if a person needs to flush it two or three times to get rid of the debris. There are many 1.28 gallon flush toilets that can easily remove the debris in one flush and many others that require multiple flushes to remove the same amount of material, all while using the same amount of water per flush. There is one company that established the protocol and original test criteria and acts as a repository of all the government testing of toilets to verify they meet the current Water Sense standards. Currently, that standard requires the aforementioned 1.28 gallons per flush and the ability to consistently flush a minimum of 350 grams of debris, to be classified as Water Sense rated. Here is the clarification that consumers and professionals need to know before making a purchase: the protocol and test procedures do not stop at 350 grams, they test toilets in their ability to flush waste material all the way up to 1000 grams of debris per flush. And when you look at their data which is published about twice a year, there are many toilets, both cheap and expensive, that will move 1000 grams of debris per flush. This Toilet’s Water Sense Specs: This toilet was tested to consistently use only 1.28 gallons of water to remove 350 grams of debris out of a possible 1000 grams during testing. ***Note: There are numerous other toilets available that do remove 1000 grams of debris in one 1.28 gallon flush. A label like this is not required by this code to be added to the packaging of toilets, which is a shame because it would eliminate a lot of the confusion and frustration for consumers. As a professional who knows this, I have had many clients tell me they did not want to get building permits because they didn’t want to have to buy a new toilet that does not work well. I then have to convince them that there are WaterSense certified toilets that work well and are very much worth getting because they will save them money over time in water costs. That label is a must if the government really wants to do the job right instead of just passing laws that make themselves feel like they are doing what is politically correct. Value on the part of the consumer only becomes apparent when the consumer has quantifiable data to justify a purchase, not just a government mandate like the current law requires. With so many toilets available today that do move 1000 grams of debris, why is the current WaterSense threshold of 350 grams still in use? Over a decade ago when the code was first enacted 1000 gram flush was rare, now it is not. These tests are published on average twice a year on every toilet sold in the United States. I give all my bath clients a copy of their latest test results before they go out shopping for their new toilet and recommend they only consider toilets with 1000 rating, the highest attainable rating in their tests. Truth: There are both name brand toilets and cheap toilets that have this 1000 rating. You just need to read the published test results to find out which ones. Most toilets look great on the outside, but for most manufacturers, that smooth shiny nice looking glazing stops just past the turn at the bottom of the toilet bowl and the remainder of the water pathway is rough, porous, unglazed clay. Think about that. Imagine how much waste sticks to that rough porous surface and remains coating that pathway. Not an appealing thought, and a good reason some toilets don’t flush as well as they could or be as easy to keep clean after installation. Remember, the water sitting in the toilet bowl is touching that rough area that can’t be seen, so it could harbor more bacteria than a toilet that has a fully glazed pathway that is less likely to have debris stuck to it. If you are like me and you know this fact, I would look for toilets that do glaze their entire water pathway. That is easy since the two most popular manufactures of toilets both offer that option, and that option is available on both low-priced and expensive toilets in their lines. Kohler is the only manufacturer I know who glazes the entire pathway on the majority of their toilets. Toto has an add-on feature they call SanaGloss glaze, which is just paying extra for them to glaze the entire pathway. I do not mean this to be an advertisement for one brand over another, but some brands have very avid devotes—Toto in particular—that are blind about product strengths and weaknesses. Over a decade ago when this water testing first started, many of my clients that were Toto devotees where shocked to find that most of the Toto product line, at that time, had very poor flush efficiency ratings of 600 or lower. They only had a few toilets that attained the 1000 rating, most that did had the SanaGloss feature. Toto is a good company and has responded to the challenge and now has many toilets that have the 1000 rating. I only told that story to emphasize that you need to follow the chart to make sure you buy a toilet that flushes well. Do not trust salespeople or brand names! Find the look you want in a toilet that flushes well, at the best price. A few years ago I remodeled a master bath for an elderly Japanese client, a relative of numerous other clients I had already worked with. Her relatives all insisted she needed to buy an ADA toilet, because they had and it was so much easier to use. That is a toilet that has a taller bowl so, in theory, it is easier to sit down and get up off the toilet. Two months after we were done with the project she called me and asked if I could please come back and remove that toilet and install another. She told me the problem was that ADA toilet was too high for her. She was short, but the real issue is we are all built differently. Her legs from the knee down to her feet are unusually short, even for someone her size. Shorter than the height of the toilet seat off the floor, so when she sat down, her feet did not touch the floor. This caused two issues, her legs would get numb from lack of circulation as it was cut off by the back of her legs on the toilet seat, and she felt very unstable on the toilet without her feet on the floor as it was difficult for her to safely get off the toilet. Her husband really liked the toilet, but it was just a bad fit for her. So, make sure before you buy a toilet to sit on one of the same size as the one you are considering to make sure it fits you. One of the biggest complaints I hear from other professional about the work triangle is that it’s obsolete because microwave ovens were not available at the time that the original study was done. I think that is nonsense! As long as you understand what it does and how a microwave works on a fundamental level and how it is used on a functional level, (that does vary greatly from one family to another) you can easily figure out which type of microwave to buy for your kitchen and how to incorporate it into the work triangle. Power is obviously critical to microwaves, being an electric appliance. However, size is equally as critical — in the wrong way you may at first be thinking. If you read the wattage rating on two microwaves, as a consumer you might think “okay, these two microwaves are identical in efficiency because they have the same power rating.” If, one is a small countertop microwave with a 1000 watt power rating, and the other choice a large microwave that’s twice as big with the same power rating, most people think they’ll just buy the bigger one since they can fit bigger items in it while still keeping the same power. The problem is that microwaves work by emitting and bouncing around microwaves inside the oven, back and forth through the food over and over again. If you have a bigger microwave, you have a bigger volume that these waves are bouncing around in. Microwave efficiency, is ruled by a physics concept called the inverse square law. Meaning, in this example, if one microwave is half the size (volume inside) of another microwave with the same power rating, the smaller one will actually be 4 times more efficient than the larger one — the inverse of 1/2 is 2 and 2 squared is 4 . In turn, the bigger microwave oven cavity as in our example, would need to have 4 times the power (4000 watts) rating of the smaller oven to be as effective as a smaller microwave. These numbers all relate directly to how powerful the oven needs to be based on oven size and how long the food needs to be in the oven to heat up. So in general, you’re better off with a smaller microwave that has a good power rating than a bigger microwave that has the same power rating, because it’ll be more effective and get things cooked more quickly. Except for dual capacity ovens which use both microwave and conventional cooking, but those combo micro/ovens when used only as a microwave will follow this rule. So, the key for microwave oven placement is real simple: the closer you put it to a refrigerator and/or water supply, the better off you are. Simple rule. No need to make the work triangle obsolete. A combination unit integrated with a range hood, a microwave-hood combo. I’m going to talk about each one of those in-depth to let you know their pros and cons, but first, there are two other types of microwaves available that allow you to put a microwave in the work triangle without giving up counter space, in my opinion a key concept for a microwave, since the microwave should be in the work triangle where usable counter space is at a premium. I’m going to talk about those first because I recommend use of one of those more often than any other microwave and if you want your kitchen to really work, you’ll to want to use one of these two microwaves instead of all the other options, listed above. The first of these two other types of microwave is one that I am not fond of, the “under the counter microwave”. It literally mounts underneath your countertop in a base cabinet, like a built-in wall unit only much lower. It typically functions more like a microwave drawer. My biggest concerns about this microwave deal with how you use a microwave ideally and safety. Ideally, a microwave should be slightly below eye level when in use so that you can peek in to see how its cooking. In the event you turn it on for too long of a time, which is easy to do (I do it all the time) you want to be able to see what’s going on at a glance. That way, if something’s burning or needs more time added to it, you don’t have to go out of your way to see if that’s the case. The best way to accomplish that is to position the microwave so that you are able to look down into it at a slight angle — in other words, just below eye level. In most kitchens for most adults, that is with the bottom of the microwave no higher than 54″ off the floor. If you put a microwave below the countertop, you’re putting it below waist level and will have to be bending over to look inside, and load and unload item from the microwave, which is not ideal. In regard to safety, a microwave is the one device in a kitchen that, in my opinion, you want to keep away from young kids. You don’t want young kids (primarily 2–6 year-olds) to be able to reach it because you’ve got no idea what they’re going to put into it or how long they’ll set the cook time for. They could put a cat or a dog in there — even elderly people have been known to do that — but kids would be more prone to doing something like that because they don’t understand the concept of what’s going on. I’ve always felt that under the counter microwaves are such a huge liability in this regard that it makes me very uneasy. I’m fearful of it and I don’t like it. I actually have no photos of this application in my gallery because after I make my customers aware of my safety fears and all the other options they have available, they choose one of the Over the Counter options, in the next section. Now, I’m not telling you not to use these. As with all the things I talk about, I’m merely trying to give you the pros and cons that you likely won’t hear from anyone else, from other contractors to appliance salespeople. I feel there are much safer and more functional alternatives to under counter microwaves, the “Over the counter Microwaves”. This is the option that seemingly nobody knows about, not even appliance salespeople, which is a real shame because it’s the one I prefer to use most and have gotten the best client feedback for in my 41 years in this trade. I send people down to appliance wholesalers and if they don’t ask for sales people who I regularly work with they repeated end up guided to a different type of microwave. I can’t tell you how many times I’ve had clients go to an appliance distributor and say they want an “over-the-counter” microwave, just to be told “oh, you mean the over cook top microwave,” and are shown microwave hood combo units built into a range hood, because the sales person had no idea what an Over the Counter Micro was. No, those aren’t it! An over-the-counter microwave is meant to be bolted to the bottom of a wall cabinet or attached to the wall so the bottom of the micro is above the countertop, leaving the counter space available for other use. Unfortunately, there’s only two manufacturers that make them, and they’ve both got their own little idiosyncrasies in terms of pros and cons and installation constraints. The first one of them is part of the GE Spacemaker series. GE drives me crazy because every year, they change the model number and hide it deep within their catalog, which is primarily why it’s so hard to find when talking to the average appliance salesperson. It’s the only microwave that’s listed as a “countertop microwave” in their Spacemaker series, and while it can be used as the freestanding countertop microwave they classify it as, the unit becomes exponentially more functional when the optional “wall cabinet installation kit” accessory is brought into the mix. This GE microwave happens to be 24″ wide and has four holes at the top of the microwave that are covered with little buttons. If you remove those buttons, you can use the installation kit—which is really just 4 specialized bolts—to hang the microwave from a wall cabinet above it. You can see these bolt heads inside the cabinet, but it doesn’t disrupt use of the cabinet and lets you get the microwave unit up off the countertop. This installation method also gives more flexibility on how much vertical clearance you can get with the reclaimed counter surface. For instance, in installations where it’s top is attached to a standard wall cabinet bottom or in a corner under regular wall cabinets, the average space between the countertop and bottom of the microwave is about 6 or 7″. I’ve done other installations where I’ve reduced the height of the cabinet the microwave is mounted to, leaving the bottom edge of the microwave flush with the bottom edge of the surrounding cabinetry, which is normally 54″ off the floor, leaving an 18″ space between the micro and the counter. Because this microwave vents from the bottom, it works without you needing to worry about ventilation. GE Under Cabinet Micro -A standard under-cabinet installation, leaving 6-7″ gap between countertop and microwave bottom edge. The second of the over the counter microwaves which is a much cleaner looking and aesthetically pleasing microwave made by Sharp, their model R1214. The R1214 model has a stainless steel exterior, but they do have other finish’s, white-1211, black-1210, etc. This microwave is not a countertop microwave. It is meant to be installed between two wall cabinets. The sides of this microwave are not very attractive looking because it’s meant to be covered up by cabinets on eache side, similar to a slide-in range. That feature does limit where you can place it much more than its GE counterpart. Nonetheless, it stands out nicely and has a really attractive look. Not only that, it has a feature that the GE over the counter microwaves do not: it has a rotating turntable in it, and a slightly larger cavity. Turntables make microwaves more effective because they heat food more evenly. If you consider these two, you can pick whichever one you want as they’re both very good. Most of my clients prefer the Sharp since it’s a nicer looking microwave once it’s installed, but it does have the downside of being more limited on where you can put it. The GE, because of the way it attaches to the bottom of the cabinet when mounted can be put in any number of places. One place where I really like mounting the GE microwave is in the corner, because corners in kitchens where you have an L return are pretty much dead areas that you can’t use for counter space and most people just keep miscellaneous things stacked there. You might as well put the microwave there, because that corner is usually right near the water supply and/or refrigerator in the kitchen. The cost between the two is about an even wash. I think the last time I had a client buy one, the Sharp model was about $340. The GE model was about $260, but with the $60 trim kit, it’s about $320, so the net difference was about $20, so cost shouldn’t be too big a deciding factor in terms of which one you ultimately choose. The biggest issues for me are what you want it to look like and the available options for placement. I highly recommend these microwaves because they give ideal placement, using space that you’re never going to use otherwise while you maximize your kitchens usable counter space. This microwave type needs very little introduction as it’s the kind most likely to be found in a residence and on sale everywhere. Countertop microwaves do not require any special installation or mounting hardware, they can be simply taken out of the box, plugged in, and put immediately to use. Their biggest benefit is their versatility in placement, they can be put wherever you have a counter top. Conversely, their biggest downside is the amount of counter space they take up, and the fact that you can never use that counter space as a work area. 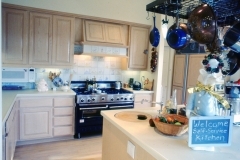 Standard kitchen countertops will have a depth of 25 1/2″, and while microwaves do not have a set “standard” size, the minimum depth measurement is 16″, which by the numbers should leave 8–9″ of usable counter space but it will most likely be much less, making the space unusable as a work area. One way to make a counter top microwave more usable is to create spaces in your design where counter tops are deeper than the normal 25 1/2″ as in the pictures below which has a standard 24″ deep base cabinet on the kitchen side and a 12″ deep cabinet on the back side of the peninsula, with an overall counter depth of 39″. In this case, in my own home, I created a stone enclosure to hide the micro, can opener, and food processor from view from the family room. That enclosure also acts as a place for vases and plants on top, and also hides the sink and main kitchen work area from the family room. That counter space 16″ deep in front of the microwave is the most used food prep area in my kitchen, being between the sink and cook top. 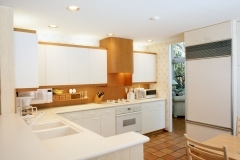 Microwave/Range Hood Combination (Microhoods) were pioneered by GE in the late 1970’s with their Space Maker unit. It bolts over the cooktop. I have used them sparingly. The reason why? They don’t operate or function as well as other options. As I’ve mentioned earlier, the ideal height for a microwave is slightly below eye level so you can easily see into it, no higher than 54″ off the floor is ideal. If you put that microwave/hood over a cooktop and you mount it no more than 54″ off the floor, you wont be able to use your large pots and pans on the rear burners of the cooktop which are normally the largest burners, because the hood will be in the way of taking the lids on and off those pots and of stirring the pot contents also. If you mount the micro/hood higher up high so you can still use large pots and pans you wont be able to see in the microwave, and will actually be lifting objects over your shoulders to place items in the microwave for heating. If you have to raise items above your shoulder level to put it into something, you’re putting stresses on your shoulders that you shouldn’t have to put on them. This becomes an extremely important consideration for the elderly, as they’re like to develop strength and joint problems with their shoulders and elbows because of having to lift things in and out of the overhead unit. They’re not very functional, and depending on the user, could be an easily overlooked health/safety problem. The other main reason why I don’t like those microwaves is that the fan in them doesn’t do a very good job of venting. They simply do not do as good a job at venting as a stand alone vent does. Some of them don’t even vent outside the house, they just circulate the air inside the house. I believe that if you’re going to have a vent, get one that really works and is going to do the job. What’s the point of paying extra money for a fan in a vent that doesn’t work? As I said earlier, these units neither function nor operate well. There is one last reason why I don’t like these microwaves, but it isn’t directly related to how these units work in day-to-day use. I do not like when big manufacturers engage in deceitful advertising. When those microwaves were first brought to market, GE engaged in some highly deceptive promotion. Any advertising that manufacturers use should be straightforward and tell you exactly what the pros and cons of a product are. In the early 80’s, they promoted this product with a TV commercial in which a young and pretty gal comes on-screen, goes on about how great this new microwave is, and walks over to the microwave above her cooktop showing how convenient it was to get in and out of it. Microhoods were so great and going to save everybody time and space by integrating the microwave with the range hood. Original GE Add for the Spacemaker Micro-Hood. Notice this girls hip bone is almost 6″ above the 36″ counter edge. Does she really have a 39 or 40″ inseam? Or is she standing on a platform to make the microwave seem really convenient and the right height for her to use? I am 6’7″tall, note that my hip bone is about 2″ above the 36″ tall counter top which makes sense since i have a 35″ inseam. Is the girl in the add next to me really 6’11” tall with a 40″ inseam? But if you paid really close attention to this young woman as she walked over to this cooktop to do this, her waist and hips were actually well above the cooktop cooking surface area and the microwave itself was below her shoulder level. While this is possible for me because I’m 6’7”, it’s impossible for an average size woman (and again, many men too) to have that be the case. They had her on a platform that was putting her on much higher ground than she would be in a real kitchen. It was a totally deceitful ad. When those first microwaves came out, the specifications on them required them to mounted so low that you couldn’t put any large pots or pans on the back burners, which typically on most cooktops, were the bigger burners. When you install any appliance, you must install it to manufacturer specifications. If you don’t install an appliance to manufacturer specs you void the warranty, which means when you have a service call made and a tech is sent out there to do work on it, you’re going to incur an out-of-pocket cost rather than be covered by the warranty. Back then, I had multiple people complain that they couldn’t use the back burners at all. All I’d be able to say was “well I’m sorry, but I can’t raise it because that violate the manufacturer’s specs”, the only other option is to put in a real hood and add a counter top or undercabinet micro. Manufacturers do go through a learning curve with their appliances. Within a decade later, they changed the specs and started mounting them higher like they should, but that just puts the microwave higher which helps with pots on back burners, but put the micro at a more conveneint height for most people. There are also some repair issues my clients have had with these units I want to share with you. When these first microhoods came out, they originally had dials because back then we didn’t have touch controls then. Nowadays, they all have touch controls on them. Touch control devices work by sensing and responding to the heat from your body, which means that if you have a cooktop underneath this microwave, the heat from your cooking could drive them crazy. Not only that, they will also cause the circuit boards to go fail sooner. In my experience, you’re relatively safe if you place these units over an electric cooktop. Electric cooktops only heat the surface of the cookware that is making contact with the burner, whereas a gas cooktop heats everything. When you turn on a gas burner, the air temperature in the room begins to change immediately, and I’ve had more customers have had problems with these units when installed over gas cooktops than any other cooking surface. I have had multilpe clients that put these units over gas cook tops tell me they have had multiple circuit boards for the touch controle replaced, and when their warrante was up it was cheaper to replace the microhood than pay for a new board. Save There’s many microwaves that are built into wall ovens, and in general, I like them. They’re generally really good ovens, and the ones I’ve been really fond of are the ones that multitask and be a convection oven with a microwave function built into it. These units are aesthetically attractive and I’ve had a lot of feedback from customers that found them to be really good products. That said, they are bigger cavities than standalone microwave units are, as these are real ovens that has a microwave in it. Some come as separate units that install above the wall oven, which then leaves you wasting a lot of space, because you’re stacking a smaller unit on top of a larger unit while still giving up the same amount of horizontal clearance as the wall oven beneath it. Not only that, but wall ovens are generally going to be further away from your water and from your refrigerator, as covered at the beginning of this article. Microwave oven built-in to a tall cabinet next to the Oven cabinets are generally further from water. This kitchen has a second sink in the island to shorten that distance, but the micro is sill further from the fridge than desirable. I hear this very often from potential clients. When considering the options for their bathroom remodels, to most homeowners (and unfortunately way too many tradespeople as well) this sounds like a relatively simple change to make. They understandably but mistakenly think that showers and tubs are more or less the same thing, just different types of bathing areas. They put out water, keep it from splashing all over the place, and send it down a drain. All the plumbing is there, so all it should take is a few small modifications to accommodate a different form factor, right? In truth, here in San Diego, this change is rarely as simple as it sounds if it’s to be done properly. Changing an existing shower into a bathtub is simple since the 2″ line is in place and readily accessible a 1 ½ line for the tub can feed into it. Going from a tub to a shower is not often an easy process since it is a violation of code to run a 2″ line, which is required by the new shower, into a 1 ½” existing tub drain. The possible ease or probable difficulties that will arise in converting a tub to a shower are completely dependent upon how a home is built and the specific configuration of the existing plumbing in that home. Here in California the majority of homes built since 1970 are slab on grade. Most older homes have perimeter footings, crawl spaces, and wood framed first floors. Crawl spaces (or basements, which are very uncommon in California) below the first floor of a home make changing a first floor bathroom tub to shower very easy, while slab-on-grade construction can, and often does, require cutting large amounts of concrete and digging 4 to 6 feet deep to reach a main drain large enough to tap into to feed the new 2″ line. Whether a home is single story or multistory can also play a role in how easy it is to connect to a 2″ drain. Existing kitchens, bathrooms or laundries either above or below the bath where you want to convert that have a 2″ drain, can but will not always, make for a relatively easy new 2″ drain connection to those existing drains. For Homeowners: Insurance will not pay for repairs caused by work done in violation of building codes. If you shower backs up because of clogged 1 ½” drain and overflows outside the shower dam, will the insurance pay for the damage? Furthermore, if you sell your home and for any reason the new buyer finds out about the code violation, do you want to be liable for correcting the violations and the necessary repairs they cause? For Professionals: You are supposed to know better. If things go south on this project for any reason or there is damage or a law suit, you are at the top of the list for liability. Your insurance company will most likely will bail on you, because your actions could be considered fraudulent, and your license could be in jeopardy. Here I will touch on another topic that I will talk about at much more length in future blog articles: National Building Codes, now under the purview of the IBC. The code I mention above in this article regarding drain size for tubs and showers, has been code for many decades. It is not a bad or illogical code with no justification or science based reasoning, as many of the new codes are. In this article I will not justify the code other than to say, that, in today’s typical home, a shower drain does get clogged much more quickly than a tub drain. And remember that a tub has a dam that is 12″ or more in height, while a typical shower dam is only 0″ to 4″, including today’s ADA showers. In turn, you have far less likelihood of dam overflow and damage to the rest of the home if the drain gets clogged with a tub than you do with a shower. Why I think we need a Code Change: The single biggest change in our national home construction practices from the time period that this code originated from is the change from basements and crawlspaces below the first floor to the current practice of slab-on-grade construction. In addition to the slab on grade is the more current pre-tensioned and post-tensioned slabs many big builders are using in California for both single and multi-family housing. These slabs are not meant to be cut into for any future changes. Cutting into these slabs seriously compromises the structural integrity of the slab and the home above it. Another change in construction that affects the cost of plumbing today compared to the cost of plumbing decades ago is the advent of Acrylonitrile Butadiene Styrene (ABS) pipes instead of cast iron or copper drains. The minimum size drain feeding any bath tub or shower should be 2″. I personally would be OK with all fixtures having a 2″ minimum drain. Fixtures with 1 ½” connection like tubs and lavatory sinks, would transition to the 2″ easily. This code change would make new homes more adaptable to future needs and alteration of the home and make drain lines both drain faster and less likely to clog. The bathroom in the project referenced here is located on the first floor in a slab on grade built home with no bathroom above it. If there were a bathroom directly above it with a shower in it, the odds are quite high that there would have been a 2″ shower drain coming down through the wall that we could have tapped into for the downstairs bathroom and easily connected to, which is perfectly legal and adherent to building code. Unfortunately, there was no shower or bathroom above this particular bath, as the second-story bathrooms were on the other side of the house, rear, along the outside wall. I was aware of this potential problem and told the client about it. Upon my survey of the home, I found a clean-out that is for the main sewer line in the garage floor on the other side of the wall between this bath and the garage, about 3 feet into the garage from the sink you see in the pictures. It was pretty obvious that the main sewer line ran from the kitchen and upstairs baths at the rear of the home right under this bath sink and out through the garage to the street sewer connection. I told the client that there most likely would be an additional charge if we needed to jackhammer the floor and dig to that main line to meet code, and added that contingency amount to our contract with a note that the client would get a refund of that amount if that concrete and demo work turned out to be not needed. Upon opening the bath walls and ceiling during construction, we could not find a 2″ line and did need to open the slab about 6 feet laterally to the sink area and dig over 4 feet deep to reach the main line to tap the 2″ shower drain into it. This same bath was the subject of another issue and blog entry dealing with venting. Millennials may not have any context to understand what I am about the write about, but those of you over 60 will. I, or my family – mom and dad, has owned refrigerators that lasted over 30 years with absolutely no service work. Today, if you buy a new refrigerator, you are lucky if it lasts the 5 year warranty period before the compressor, solenoid, or some other costly part goes out. And after that 5 year period, you are faced with an onslaught of one part after another that cause the refrigerator to fail or worse, cause major damage to the surrounding floors, walls and cabinets. If compressors from decades ago lasted 30+ years, why do they only last 5 years today? The simple reason is that today’s compressors are under-engineered purposely to last no longer than 5 to 7 years, so the manufacturer can sell you repairs or another refrigerator altogether. Those compressors from decades ago were over-engineered so the manufacturer could brag and advertise about how long their product did last. Yesteryears Model: Family or small privately own manufactures who grew their brand from scratch building a reputation and public trust. Todays Model: large mega corporations who own many competing appliance brands, but are in fact, in collusion with a few other mega corporations with the same practices, maintaining a monopoly on that market. We have no competition in that marketplace. Designed Obsolescence: Our entire society is at the mercy of large corporate and financial interests that control and dictate how long a product will last. They have bought out all the old appliance manufactures that once had great track records of lasting decades and supporting their product long after manufacture. Those large corporate concerns now spend millions on research to find out, on average, how long we live in our homes, how much we are willing to pay or tolerate to find the sweet spot, so the product will last just long enough to keep us relatively happy and pay the asking price. In this case about refrigerators those manufacturers have determined that sweet spot is about 7 years. Hence, your refrigerator is likely to last just long enough for the 5 year warranty to expire before it needs major repairs. Many times it lasts less, particularly in parts of the country as indicated in the next section. It is also very common for manufactures to not offer replacement parts for models longer than 5 years after the model was discontinued or replaced by a newer version. Making sure you need to buy a new model when repairs are needed. Industry Standards that minimize massive lawsuits against all manufacturers within an industry: All domestic refrigerators, to my knowledge, use the identical patented water delivery system, for their water and ice compartments. (They probably also use similar specs on their compressors.) This water delivery system is designed to fail, and, in my experience, is the single most likely component in your kitchen to cause catastrophic water damage to your home. The refrigerator water delivery system is many times more likely than a dishwasher, garbage disposal, or other plumbing problem at the sink. This industry standard practice makes it extremely difficult to litigate one manufacturer for damages when that system fails and ruins, a full room of hardwood flooring, adjoining cabinets, walls, or creates mold. The manufacturer’s first defense is: it is an industry standard, so we are not the culprit and not liable. Water Delivery system: without going into great detail with drawings, there are two weak points to the system. The solenoid, a combination of an electronic switch and mechanical valve, that opens and closes the water supply to the fridge when you push the water button for a glass of water, or the ice maker demands water to fill the ice making mechanism. If you live in a part of the country (like San Diego) where you have a very hard water supply (lots of hard minerals and particulate matter, calcium etc.) this solenoid will not last long, often less than the warrantee period. In other parts of the country it will last much longer. The failure of this solenoid to fully close due to old age or calcium build up is the initial factor that begins the catastrophic water failure and associated damage. The water line from the solenoid to the ice maker. In all manufacturers it is a plastic tube, with one or more connections, all of which is not designed to hold water under pressure. The fact that it is not designed to hold water under pressure is the final factor that ends with the catastrophic water damage. It is the final stage in a series of events that started in the solenoids failure to close completely. The solenoid’s valve fails to shut completely: Due to calcium buildup, rust, and other particulates, or simply a failure of the electronic or mechanical part of the solenoid. A very small, but consistent supply of water slowly and continually trickles into the ice box when it is not needed and not wanted: Caused by the solenoid valves failure to close completely. The trickle of water in this line now slowly freezes over: This continual flow allows water to always be in a part of this plastic water tube which is not supposed to have water in it. If the solenoid is working properly this gravity fed portion of the line would be dry after the solenoid closes completely. Now, the plastic tubing that was not designed to hold water under pressure has water in it under pressure at 60 to 80 psi, the same as your water faucets: With the wire switch in the down position, the ice maker is telling the solenoid to send water, but the frozen ice blockage in water delivery line prevents the water from entering and keeps the solenoid completely open. By now the damage is done: Homeowners rarely see or hear that water as it sprays on the wall behind and the floor at the back of the refrigerator. They normally do not notice it until they realize their floor is buckling or hear water squishing under their feet. They see the water damage as it makes its way out from behind the fridge into the room where they can see its effects. If you pay diligent attention to your ice maker you can see this condition coming. You will be out of ice for a few days, but little or no new ice replaces it, even though the wire ice switch is down. (check that switch before you call a tech, if the wire switch is up, that has turned off the water to the icemaker) If you catch it early, turn that wire switch up (turning off the water supply immediately before serious damage) you can avoid a lot of cost in replacing floors or drywall before the next step begins. Design the water line behind the fridge that connects the icemaker to the solenoid, to hold water under pressure. This line leaking water under pressure is the final cause of all the damage. If that line held water under pressure for only a few weeks, the homeowner would have no ice and know there is something wrong. They could put the wire switch up and have plenty of time to get the solenoid replaced and the line deiced. (appliance tacticians deice the line with a simple hair dryer) And, no damage to any part of the home. Higher end refrigerators with smart functions could have sensors that knew if and when that water delivery line was under pressure, turn off the solenoid, and alert the owner of the problem and the need of a service call. Here is the crazy part: a water delivery line that could hold house water line pressure would probably cost the manufacturer about 50 cents more to manufacture. Plastic water lines that are designed to hold water are not expensive. Install a drip pan under your fridge. If there is a crawl space under your floor, not a concrete slab, a drip pan can catch this water as it trickles down the wall and allow it to run into the crawl space instead of out into the room. This will protect your finish floor, sub floor, underlayment, and framing from all the water damage. I do this regularly for clients that want real wood floors running into their kitchen, as wood floors of any kind, (laminates included) are destroyed by standing water. For my clients on slabs, I try real hard to talk them out of real wood or laminate and encourage them to consider either ceramic tile that looks like wood, or LVT, that has many patterns that are very hard to tell are not real wood. Install a high quality home water softener and feed the fridge water first through a good water filter as well. We typically put that water filter under the kitchen sink, where there it also feeds a water filter devoted faucet on the sink for cooking or drinking water that is not refrigerated. The softener removes the hard minerals from the water and the filter removes particulate’s and other unwanted chemicals for the clients health. This stuff I am talking about is not rocket science. It is simple common sense and my suggested solution would cost manufacturers pennies not dollars to fix. I cannot begin to convey my frustration with all big corporations, and the direction they are leading our society. Before we started work on one of our earlier projects, the client told me that the vent installed in the bath was still fairly new and only a few years old. He had it and two others in the upstairs baths installed as replacement units by another contractor, who had been highly recommended by numerous neighbors. He wanted to reuse this ventilator, but told me both it and the ones upstairs did not seem to be working properly. He bought them because they were highly-rated, powerful and ultra-quiet models, but since their date of installation all three were very noisy and seemed to draw even less air than the old builder fart fans they had replaced. Right after listening to his problem, I turned the fan on and off a few times. He was right, there was something wrong. When you turned the fan on, for the first 4 to 7 seconds, it sounded as if the fan would not even turn on, then the sound of the motor working very hard would start and continue. I, at 6’7″ tall, could easily feel very little air movement as I placed my hand on the vent. I responded that the fans appeared to be a NuTone ultra quiet fan, a good quality products that should be both quiet and powerful, and that we would investigate the fan in this bath after we began construction. In my mind and while measuring the room I had already checked the first possible cause of this problem in this bath. Make-Up Air: If you have a fan drawing air out of a room, you must make sure there is a path for the same amount of new air to enter the room from the rest of the house or outside the home. If the air you remove is not simultaneously replaced by the same amount of air you are removing, a vacuum is created which will bring the air movement and motor to a halt. Little or no air movement and a very noisy fan that is overworking is a symptom of too little or no make-up air. The most common and easiest location for this make up air space is the space between the bottom of the door of this bath and the floor. (A secondary, rarely used, way is to place a through vent from the bath into an adjoining room or hall). That air space must be of near equal size in square inches of total opening as the size of the vent leaving the fan. All NuTone fans require 6″ diameter vents to operate within specs, so using high school math, a 6″ diameter duct has a surface area of πr² 3.14 x 9″ = 28.26 sq. in. The door in this bath is 30″ wide, so the space between the top of the floor and bottom of the door should have been almost 1″ — specifically, 0.9 inches tall. At that time, it was only about a 5/8″ space. This slightly undersized opening for the fan would make the fan work a little harder and noisier, but not enough to cause the seriousness of the symptoms seen. So there was something else, much more serious, contributing to the problem that I could only find after demo. After starting our work and removing the drywall from the walls and ceiling of this bath, the cause of the problem was obvious. As stated, this NuTone 110 cfm vent requires a 6″ duct. The original installer simply connected this NuTone fan to the original 3″ fan’s ducting with a 3″ to 6″ transition. If the 3″ duct only ran a few feet to an exterior wall, that would have caused the fan to work a little harder, but in this case, that 3″ duct was almost 40 feet long, passing over a laundry room and through a long section of garage. Making it even more difficult, the spaces this existing 3″ duct was passing through had other furnace ducting, wires, and structural obstacles that made it impossible to run a new 6″ duct through the same path. Our only solution for this bath was to replace the fan with a Panasonic model with all the same specs except one: it only needed a 4″ duct. That is the only reason why on jobs that require only an 80 or 110 cfm duct I prefer Panasonic fans. We were able to run the new 4″ duct through the spaces doing minor damage to drywall on soffits in the garage to make the venting in this bath work the way it was intended and the client had originally hoped for. The symptoms this fan had were caused partially by the make-up air space being too small, but mostly by the incredible resistance of this 6″ exhaust vent being connected to a 40 foot long 3″ duct. The fan behaved like it could not move any air, the pressure on both the intake and exhaust sides were so great it took the motor 7 seconds to start moving fast enough that it could even be heard, and it never was able to overcome the resistance enough to move air at the units specified cfm rating. Another benefit to changing this fan to a Panasonic model with its 4″ duct is that the make-up air under the door did not need to be increased. Since the Panasonic fan was engineered to be quiet and operate at full efficiency with a 4″ duct rather than a 6″ duct, the πr2 equation above with the new Panasonic variable became is 3.14 x 4″ = 12.56 sq. in. Divide that by the 30″ door and the clearance needed between the door bottom and floor is only 0.4 inches, less than ½ inch, so our existing 5/8″ clearance was fine. This is another reason I prefer to use the Panasonic brand for these 80 and 110 cfm fans. Over that cfm rating (130 or 150), both Panasonic and NuTone fans use the same 6″ ducting. The client asked us to investigate the other two baths with the same problem on the second floor. In these baths we found the same problem, but it was far easier to fix. Both were connected to the same 3″ diameter ducting leading out the roof. In this case the solution was simple and did not require replacing the NuTone 6″ vent fan since these are great fans that work as advertised when installed properly. This ducting was only 15 to 20 feet long for each bath and was completely accessible in a spacious attic crawl space. We simply replaced the 3″ duct with a 6″ duct. The roof jack air escape was a standard 6″ cap that did not need replacement. The original builder used a very common 6″ roof cap, then saved pennies by installing the 3″ ducting, typical builder thinking. Dysfunctional Dishwashers: Replace or Repair? If your dishwasher is not cleaning well should you try to repair it or simply replace the unit altogether? The answer may surprise you: it might be neither! About 5 years ago, my 17-year-old Bosch dishwasher was not cleaning as well as it once did. A white film and water spots were getting left on most items it washed. I was wondering if I should call an appliance repair company to have it serviced and/or repaired, or simply just buy a new one. I called a local company I knew specialized in dishwasher repair, La Mesa Appliance, to ask them that very question. They were very honest and straightforward, and their recommendation ultimately saved me from either of those expenses. They stated that replacing filters or parts would most likely do nothing to improve the unit’s cleaning ability and remove the white film and spots, explaining that the film and water spots resulted from our hard water supply here in San Diego. The Bosch’s internal filters had done a great job for years, but the most common source for this complaint in an old Bosch was that the hard minerals in our water supply had built up inside the washing compartment and moving parts. Get a bottle of Lime-a-Way cleaner or other strong mineral dissolving formula and pour a coat on all the internal moving parts and water delivery sprays. Then, pour a cup full of that same cleaner into the bottom of the tank and run the dishwasher through a full cycle without any dishes inside. Do this twice. It will clean out all the mineral deposits that have built up over the years and thoroughly clean the inside of the machine. Throw away your old standard dishwashing powder/liquid and never use it again. Instead, use Finish hard water booster cleaner, or a similar product, a specialized glass cleaner that is far better at suspending and washing off the hard minerals that all normal dishwashing mixes cannot handle. It will also help keep the minerals from building up inside your dishwasher. If after three loads of dishes the film and spots are still present, buy another dishwasher. After the second load, the dishes were coming out clean again. I got a little over three more years of good cleaning out of that Bosch unit before an internal part broke and I decided to buy a new one instead of replacing the part. This experience has led me to Ask: Why use a dishwashing mix at all, Why not just use Finish all the time? It is all I use in my new dishwasher, and it works great!